I've realized just how precious these years are with y'all. We have a small window of time to pour encouragement and life into your hearts and souls. We know we have to be intentional with you. Intentional about what words we use in our home. Which television shows and what music is okay to be heard inside our home. How we speak to each other. How we love each other. How we respect each other. Some of these decisions we are still working on but there is one that we both agreed was a non-negotiable from before you ever arrived. Each night we read The Jesus Storybook Bible and say prayers. Our desire is for you to grow up in a home that is filled with Jesus. I want you to know about Him and understand Him and realize just how much He loves you! This is such a sweet time for the four of us. I look forward to it every night. The house is quiet, we pile into the nursery, your daddy typically rocks both of you and I read a Bible story in crazy voices. I grew up doing this with my family and it has always been such a special and important time. Every night, even now as adults, we gather around and my dad reads a bible story and we each say our prayers. Our boyfriends were required to stay if they were there when we got ready to do this. Our friends have all been a part of it if they were spending the night. It has always been an important time in our day. Even though life was crazy and we were all going in different directions, we knew we would end the day together reading a bible story and praying. And we have decided to make it an important time in our home as well. Our prayer is that you come to know Jesus at an early age and that you live your lives sold-out for Him. We want our home, our routine, our lives to reflect that. And we want to be intentional with the time we have. Love that! 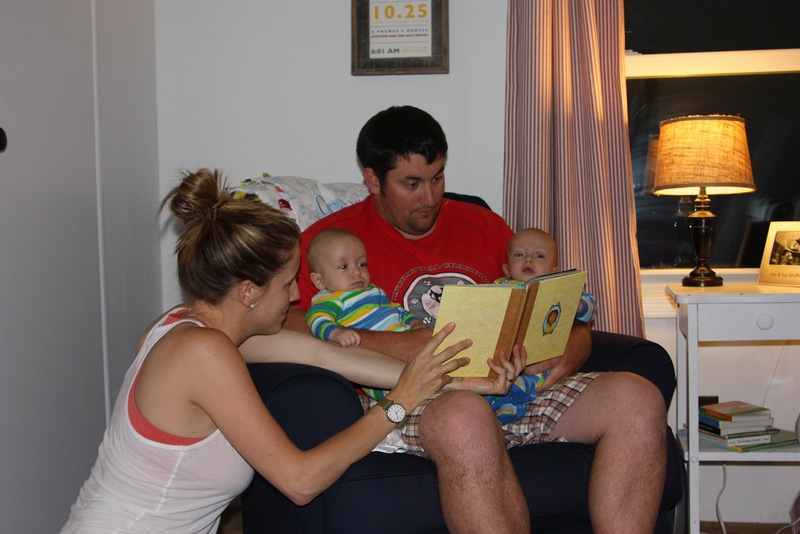 We read the Bible as a family before bed too. I grew up with my Father doing that to and he actually just gave me the books we used to read from to read to my children. Way to be intentional. Enjoy those little guy. It is the desire of my heart to see these boys be sold out to Jesus. Proud of yall! Jenny, I love this! You are such a wonderful mother & wife and a great role model for those of us who haven't yet embarked on the journey of motherhood :) Can I pin this idea for later?? Ha!